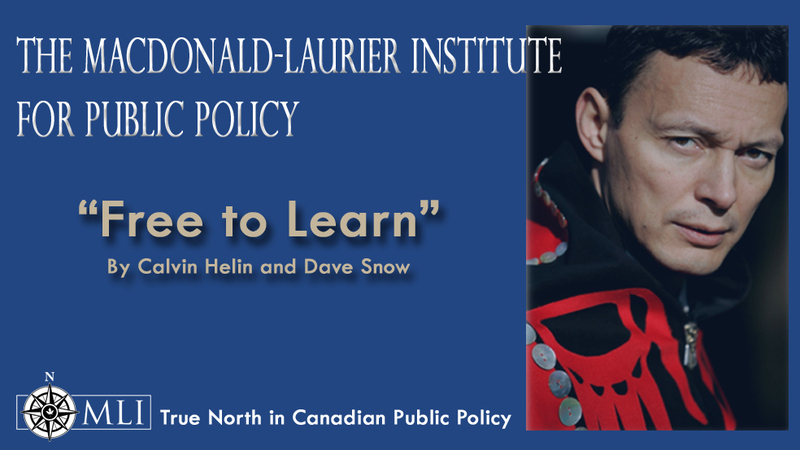 Free to Learn: Giving Aboriginal Youth Control over Their Post-Secondary Education, by Calvin Helin and Dave Snow. Helin and Snow respond to the critics — Part II, March 19, 2010. Helin and Snow respond to the critics - Part I, March 19, 2010. Native school funding needs reform, by Calvin Helin and Dave Snow, Winnipeg Free Press, March 18, 2010. For economics and decency's sake, let's help our Indian students, by Calvin Helin and Dave Snow, Globe and Mail, March 16, 2010. Dave Snow appeared before the Senate Committee of Social Affairs, Science, and Technology on March 31, 2010, to talk about Free to Learn. Click here to watch. Majority of Canadians Support Direct Funding of First Nations Students, June 23, 2010. Calvin Helin, co-author with Dave Snow of MLI study Free to Learn, was on CBC radio's ReVision Quest recently. He joined host Darrell Dennis in taking a hard look at aboriginal education in Canada in a show that aired on August 11th and again on the 14th. The program highlighted the key recommendation in Free to Learn calling for the creation of Aboriginal Post-Secondary Savings Accounts to be opened at birth for every registered aboriginal youth in the country. Aboriginals continue to fare worse than all other Canadians on almost every social and economic indicator. Since education, particularly higher education, is a great contributor to social and economic success, Canada must embark on a sustained effort to get Aboriginal youth into higher education. Yet the federal government's flagship program in this field – the Post-Secondary Student Support Program, or PSSSP – is signally failing in its objective of helping Indian students to enroll and succeed in colleges and universities. It does not empower them to help themselves. Each year, Canadian taxpayers pay $314 million toward the PSSSP. This money does not go directly to Registered Indian students, but is transferred from Indian and Northern Affairs Canada (INAC) to individual Indian bands, which in turn distribute the money to students themselves. This funding system is failing the tests of accountability and transparency; most importantly it is failing the test of getting the money to those it is intended to help. Problems that have been documented include surplus funds being used by band councils for non-eligible expenses; students being forced to wait for funding; substantial regional variation in student funding; nepotism and favouritism; and a complete lack of performance measurement or accountability. The program is patently not achieving its goal. Indeed, there is every indication that many Indian students are being denied the money to which they are entitled. While certain bands have proven capable of effectively distributing the funds, many have not. This is why we propose phasing out the PSSSP and replacing it with a system in which funding for post-secondary education is given directly to Indian students. This can be done through the creation of an Aboriginal Post-Secondary Savings Account (APSSA) opened at birth for every Registered Indian. A basic amount would be paid into each account on its creation, and this money would earn interest until the account holder becomes eligible to draw money out. To this basic amount (plus interest) would be added a further payment on the successful completion of each year of secondary education. Upon graduation from secondary school, students could use the funds for any bona fide post-secondary education program, at a trade school, college, or university. There would be strict controls to ensure that money intended to cover tuition would be paid directly from the account to the post-secondary institution. This would ensure transparency by offering the money directly to the student, and avoid the current shortcomings related to transparency, waste, and corruption. Moreover, it would ensure fairness and consistency for Indian students, regardless of band or region. Beyond benefiting young Aboriginals, Canadian society as a whole would benefit from the APSSA. As the population ages and baby boomers retire, Canada faces a demographic crisis; young, educated workers in particular will be scarce, and simply increasing immigration levels will do little to ease this shortage. Yet unlike the rest of Canada, the Aboriginal population is on average quite young. Empowering some of Canada's most vulnerable citizens to get the education they need and deserve will not only improve their quality of life. It will also contribute to the growth of the country's skilled labour force and the future economic success of all Canadians.